On a rainy night in Edwardian London, opera patrons are waiting under the arches of Covent Garden for cabs. Eliza Doolittle, a Cockney flower girl, runs into a young man called Freddy. She admonishes him for spilling her bunches of violets in the mud, but she cheers up after selling one to an older gentleman. She then flies into an angry outburst when a man copying down her speech is pointed out to her. The man explains that he studies phonetics and can identify anyone's origin by their accent. He laments Eliza's dreadful speech, asking why so many English people don't speak properly and explaining his theory that this is what truly separates social classes, rather than looks or money ("Why Can't the English?"). He declares that in six months he could turn Eliza into a lady by teaching her to speak properly. The older gentleman introduces himself as Colonel Pickering, a linguist who has studied Indian dialects. The phoneticist introduces himself as Henry Higgins, and, as they both have always wanted to meet each other, Higgins invites Pickering to stay at his home in London. He distractedly throws his change into Eliza's basket, and she and her friends wonder what it would be like to live a comfortable, proper life ("Wouldn't It Be Loverly?"). Doolittle arrives at Higgins's house the next morning, claiming that Higgins is compromising Eliza's virtue. Higgins is impressed by the man's natural gift for language and brazen lack of moral values. He and Doolittle agree that Eliza can continue to take lessons and live at Higgins's house if Higgins gives Doolittle five pounds for a spree. Higgins flippantly recommends Doolittle to an American millionaire who has written to Higgins seeking a lecturer on moral values. Meanwhile, Eliza endures speech tutoring, endlessly repeating phrases like "In Hertford, Hereford and Hampshire, hurricanes hardly ever happen” (initially, the only "h" she aspirates is in "hever") and "The rain in Spain stays mainly in the plain" (to practice the "long a" phoneme). Frustrated, she dreams of different ways to kill Higgins, from sickness to drowning to a firing squad ("Just You Wait"). The servants lament the hard "work" Higgins does ("The Servants' Chorus"). Just as they give up, Eliza suddenly recites "The rain in Spain stays mainly in the plain" in perfect upper-class style. Higgins, Eliza, and Pickering happily dance around Higgins's study ("The Rain in Spain"). Thereafter she speaks with impeccable received pronunciation. Mrs. Pearce, the housekeeper, insists that Eliza go to bed; she declares she is too excited to sleep ("I Could Have Danced All Night"). For her first public tryout, Higgins takes Eliza to his mother's box at Ascot Racecourse ("Ascot Gavotte"). Henry's mother reluctantly agrees to help Eliza make conversation, following Henry's advice that Eliza should stick to two subjects: the weather and everybody's health. Eliza makes a good impression at first with her polite manners but later shocks everyone with her vulgar Cockney attitudes and slang. She does, however, capture the heart of Freddy Eynsford-Hill, the young man she ran into in the opening scene. Freddy calls on Eliza that evening, but she refuses to see him. He declares that he will wait for her as long as necessary in the street outside Higgins's house ("On the Street Where You Live"). The event is revealed to have been a success, with Zoltan Karpathy having concluded that Eliza is "not only Hungarian, but of royal blood. She is a princess!" After the ball, Pickering flatters Higgins on his triumph, and Higgins expresses his pleasure that the experiment is now over ("You Did It"). The episode leaves Eliza feeling used and abandoned. Higgins completely ignores Eliza until he mislays his slippers. He asks her where they are, and she lashes out at him, leaving the clueless professor mystified by her ingratitude. When Eliza decides to leave Higgins, he insults her in frustration and storms off. Eliza cries as she prepares to leave ("Just You Wait" [Reprise]). She finds Freddy still waiting outside ("On the Street Where You Live" [Reprise]). He begins to tell her how much he loves her, but she cuts him off, telling him that she has heard enough words; if he really loves her, he should show it ("Show Me"). She and Freddy return to Covent Garden, where her friends do not recognize her with her newly refined bearing ("The Flower Market/Wouldn't It Be Loverly?" [Reprise]). By chance, her father is there as well, dressed in a fine suit. He explains that he received a surprise bequest of four thousand pounds a year from the American millionaire, which has raised him to middle-class respectability, and now must marry Eliza's "stepmother", the woman he has been living with for many years. Eliza sees that she no longer belongs in Covent Garden, and she and Freddy depart. Doolittle and his friends have one last spree before the wedding ("Get Me to the Church on Time"). In the mid-1930s, film producer Gabriel Pascal acquired the rights to produce film versions of several of George Bernard Shaw's plays, Pygmalion among them. However, Shaw, having had a bad experience with The Chocolate Soldier, a Viennese operetta based on his play Arms and the Man, refused permission for Pygmalion to be adapted into a musical. After Shaw died in 1950, Pascal asked lyricist Alan Jay Lerner to write the musical adaptation. Lerner agreed, and he and his partner Frederick Loewe began work. They quickly realized, however, that the play violated several key rules for constructing a musical: the main story was not a love story, there was no subplot or secondary love story, and there was no place for an ensemble. Many people, including Oscar Hammerstein II, who, with Richard Rodgers, had also tried his hand at adapting Pygmalion into a musical and had given up, told Lerner that converting the play to a musical was impossible, so he and Loewe abandoned the project for two years. During this time, the collaborators separated and Gabriel Pascal died. Lerner had been trying to musicalize Li'l Abner when he read Pascal's obituary and found himself thinking about Pygmalion again. When he and Loewe reunited, everything fell into place. All the insurmountable obstacles that stood in their way two years earlier disappeared when the team realized that the play needed few changes apart from (according to Lerner) "adding the action that took place between the acts of the play". They then excitedly began writing the show. However, Chase Manhattan Bank was in charge of Pascal's estate, and the musical rights to Pygmalion were sought both by Lerner and Loewe and by Metro-Goldwyn-Mayer, whose executives called Lerner to discourage him from challenging the studio. Loewe said, "We will write the show without the rights, and when the time comes for them to decide who is to get them, we will be so far ahead of everyone else that they will be forced to give them to us". For five months Lerner and Loewe wrote, hired technical designers, and made casting decisions. The bank, in the end, granted them the musical rights. Noël Coward was the first to be offered the role of Henry Higgins, but turned it down, suggesting the producers cast Rex Harrison instead. After much deliberation, Harrison agreed to accept the part. Mary Martin was an early choice for the role of Eliza Doolittle, but declined the role. Young actress Julie Andrews was "discovered" and cast as Eliza after the show's creative team went to see her Broadway debut in The Boy Friend. Moss Hart agreed to direct after hearing only two songs. The music was arranged by Trude Rittman and Gino Smart, and orchestrated by Robert Russell Bennett, supported by Philip J. Lang and Jack Mason. The musical premiered on Broadway March 15, 1956, at the Mark Hellinger Theatre in New York City. It transferred to the Broadhurst Theatre and then The Broadway Theatre, where it closed on September 29, 1962 after 2,717 performances, a record at the time. Moss Hart directed and Hanya Holm was choreographer. In addition to stars Rex Harrison, Julie Andrews and Stanley Holloway, the original cast included Robert Coote, Cathleen Nesbitt, John Michael King, and Reid Shelton. Edward Mulhare and Sally Ann Howes replaced Harrison and Andrews later in the run. The Original Cast Recording went on to become the best-selling album in the country in 1956. The original costumes were designed by Cecil Beaton and are on display at the Costume World Broadway Collection in Pompano Beach, Florida, along with many of the original patterns. The West End production, in which Harrison, Andrews, Coote, and Holloway reprised their roles, opened April 30, 1958, at the Theatre Royal, Drury Lane, where it ran for five and a half years (2,281 performances). Edwardian musical comedy star Zena Dare made her last appearance in the musical as Mrs. Higgins. Leonard Weir played Freddy. The first revival opened at the St. James Theatre on Broadway on March 25, 1976 and ran there until December 5, 1976; it then transferred to the Lunt-Fontanne Theatre, running from December 9, 1976 until it closed on February 20, 1977, after a total of 377 performances and 7 previews. The director was Jerry Adler, with choreography by Crandall Diehl, based on the original choreography by Hanya Holm. Ian Richardson starred as Higgins, with Christine Andreas as Eliza, George Rose as Alfred P. Doolittle and Robert Coote recreating his role as Pickering. Both Richardson and Rose were nominated for the Tony Award for Best Actor in a Musical, with the award going to Rose. Another Broadway revival of the original production opened at the Uris Theatre on August 18, 1981 and closed on November 29, 1981 after 120 performances and 4 previews. Rex Harrison recreated his role as Higgins, with Jack Gwillim, Milo O'Shea, and Cathleen Nesbitt, at 93 years old reprising her role as Mrs. Higgins. The revival co-starred Nancy Ringham as Eliza. The director was Patrick Garland, with choreography by Crandall Diehl, recreating the original Hanya Holm dances. A new revival directed by Howard Davies opened at the Virginia Theatre on December 9, 1993 and closed on May 1, 1994 after 165 performances and 16 previews. The cast starred Richard Chamberlain, Melissa Errico and Paxton Whitehead. Julian Holloway, son of Stanley Holloway, recreated his father's role of Alfred P. Doolittle. Donald Saddler was the choreographer. Cameron Mackintosh produced a new production on March 15, 2001 at the Royal National Theatre, which transferred to the Theatre Royal, Drury Lane on July 21. Directed by Trevor Nunn, with choreography by Matthew Bourne, the musical starred Martine McCutcheon as Eliza and Jonathan Pryce as Higgins, with Dennis Waterman as Alfred P. Doolittle. This revival won three Olivier Awards: Outstanding Musical Production, Best Actress in a Musical (Martine McCutcheon) and Best Theatre Choreographer (Matthew Bourne), with Anthony Ward receiving a nomination for Set Design. In December 2001 Joanna Riding took over the role of Eliza and in May 2002 Alex Jennings took over as Higgins, both winning Olivier Awards for Best Actor and Best Actress in a Musical respectively in 2003. In March 2003, Anthony Andrews and Laura Michelle Kelly took over the roles until the show closed on August 30, 2003. Lincoln Center Theater and Nederlander Presentations Inc. have announced plans to mount a new Broadway revival in 2018. It is to be directed by Bartlett Sher and begin previews March 22, 2018 at the Vivian Beaumont Theater, with an opening night scheduled for April 19, 2018. A U.S. tour of Mackintosh's 2001 West End production ran from September 12, 2007 to June 22, 2008. The production starred Christopher Cazenove as Higgins Lisa O'Hare as Eliza, Walter Charles as Pickering, Tim Jerome as Alfred Doolittle and Nixon as Mrs. Higgins, replacing Sally Ann Howes. A new production was staged by Robert Carsen at the Théâtre du Châtelet in Paris for a limited 27-performance run, opening December 9, 2010 and closing January 2, 2011. It was presented in English. The costumes were designed by Anthony Powell and the choreography was by Lynne Page. The cast was as follows: Sarah Gabriel / Christine Arand (Eliza Doolittle), Alex Jennings (Henry Higgins), Margaret Tyzack (Mrs. Higgins), Nicholas Le Prevost (Colonel Pickering), Donald Maxwell (Alfred Doolittle), and Jenny Galloway (Mrs. Pearce). The Gordon Frost Organisation, together with Opera Australia, presented a production at the Sydney Opera House from 30 August to 5 November 2016. It was directed by Dame Julie Andrews and featured the set and costume designs of the original 1956 production by Oliver Smith and Cecil Beaton. The production sold more tickets than any other in the history of the Sydney Opera House. The show is then planned to tour to Brisbane from 12 March and Melbourne from 11 May. The show's opening run in Sydney was so successful that in November 2016, ticket pre-sales were released for a re-run in Sydney, with the extra shows scheduled between 24 August and 10 September 2017 at the Capitol Theatre. 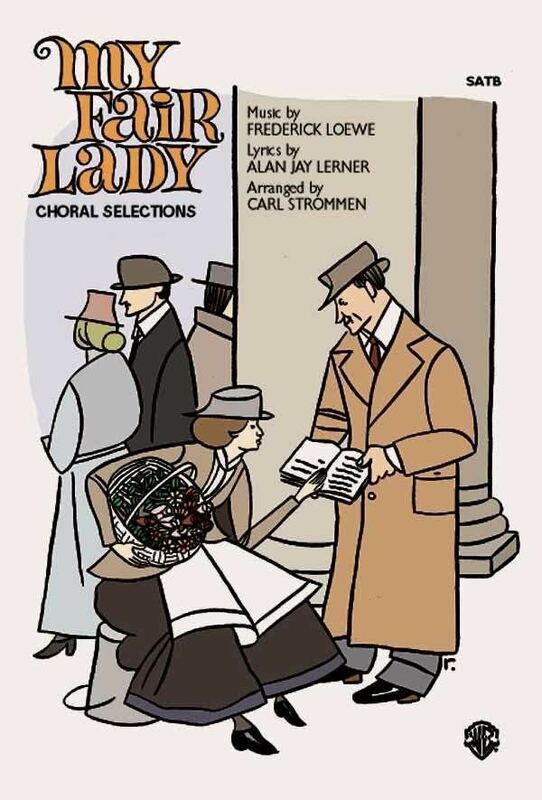 According to Geoffrey Block, "Opening night critics immediately recognized that 'My Fair Lady' fully measured up to the Rodgers and Hammerstein model of an integrated musical...Robert Coleman...wrote 'The Lerner-Loewe songs are not only delightful, they advance the action as well. They are ever so much more than interpolations, or interruptions.'" The musical opened to "unanimously glowing reviews, one of which said 'Don't bother reading this review now. You'd better sit right down and send for those tickets...' Critics praised the thoughtful use of Shaw's original play, the brilliance of the lyrics, and Loewe's well-integrated score." An Oscar-winning film version was made in 1964, directed by George Cukor and with Harrison again in the part of Higgins. The casting of Audrey Hepburn instead of Julie Andrews as Eliza was controversial, partly because theatregoers regarded Andrews as perfect for the part and partly because Hepburn's singing voice was dubbed (by Marni Nixon). Jack L. Warner, the head of Warner Bros., which produced the film, wanted "a star with a great deal of name recognition", but since Julie Andrews did not have any film experience, he thought a movie with her would not be as successful. (Andrews went on to star in Mary Poppins that same year for which she won both the Academy Award and the Golden Globe for Best Actress.) Lerner in particular disliked the film version of the musical, thinking it did not live up to the standards of Moss Hart's original direction. He was also unhappy with the casting of Hepburn as Eliza Doolittle and that the film was shot in its entirety at the Warner Bros. studio rather than, as he would have preferred, in London. My Fair Lady went on to win eight Academy Awards, including Best Picture of the Year, Best Actor for Rex Harrison, and Best Director for George Cukor. 1Overture / Why Can’t the English?